If you want to be bigger, stronger, faster and more powerful, you have found the book to get you there. This is a great book because it was written by a great coach: Christian Thibaudeau. Like all respected and influential coaches, Christian has a strong background in athletic training, but he's not confined by it. He blends his education and his hands-on experiences into a training philosophy that can benefit anyone from elite athletes to weekend warriors to those of us who just want to look great naked. Yes it's true… after months and months of waiting, the first edition of The Black Book of Training Secrets is finally available. I agree that the title may sound a bit much… after all, most coaches (me included) have shouted high and wide that there's no such thing as secret-training methods. I still believe that to be true. However, there are quite a few things that may very well make the difference between wasting your time in the gym year after year and making seemingly unbelievable progress. While these things may not seem revolutionary to those "in the know," they are indeed "secrets" to most trainees and understanding them will make all the difference in the world as far as gains are concerned. At first I wanted to name the book Thibaudeaubuilding. Although cute, I found it to be quite restrictive. Sure this book will give you a lot of info on how to build muscle and a better physique, but you'll also learn how to maximize your strength, power, and speed, not to mention how to evaluate your needs or the needs of your clients. The book is so inclusive and full of various tips and methods that I needed a name that would at least give you an idea of what it contained. The Black Book of Training Secrets is crammed full of valuable information on a variety of subjects. When I first flipped through the pages glancing over pictures and diagrams I felt a little disappointed. I felt I had in my hands another theoretical strength training book that bombarded the reader with science leaving the reader wondering how to apply any of this to the gym. But, as I dove into the text, I noticed that Thibaudeau was doing something a little different - he was presenting the theory in an easy-to-understand format followed by his personal take on each subject. And, in almost every chapter, a real world application was included to accompany the idea. Chapters 2 through 8 focused primarily on theoretical keys to strength, size, and power. These 65 pages cover time under tension principles, the nervous system's role in training, evaluating the needs of trainees through a variety of tests, training methods, how to incorporate volume based on goals, periodization, aspects of intensity, aspects of frequency, designing workouts based on fiber-types, as well as other topics. If you think that list sounds exhausting, you're right. I found myself reading a page or two then flipping back to the previous chapter to compare other notes. After a couple days of that I had to put the book in the back of my closet to let my brain cool off a bit. Chapters 9 and 10 specifically discussed bodybuilding. Chapter 9 gave tips on how to induce the most hypertrophy while working out. Tips included maximal static contraction, constant maximal tension, stretch movements, the "pump", and heavy lifting. Chapter 10 gives variations of a 4-day per week, one body part per week program designed to efficiently build massive muscle. An added bonus is a bench-press periodization program designed to increase max bench. For the football player or coach, Chapter 11 is devoted solely to training for the football athlete. Presented is Christian's Level 1, Phase 1, High-performance football training program. This chapter gives instruction on how to complete each recommended lift, cone drills, and a comprehensive 12-week guide that specifically outlines the program down to each day of the 12 weeks. I've read books on football training before, Bigger Faster Stronger (BFS) in particular. I'd recommend this chapter over the BFS program for a beginner's football program. Sit down BFS, here comes Thibaudeau. One of the jewels of this book is Chapter 12. Chapter 12 discusses proper form and execution of the Olympic lifts and gives a beginner Olympic lifting program. Thibaudeau gives the common mistakes made while learning the Olympic lifts and measure for correcting them. Anyone who has wanted to start doing Olympic lifts or is starting without the guidance of coach would benefit greatly from this chapter. Chapter 13 is devoted to Short Topics. Topics include pre/post workout nutrition, posing, post-tetanic potentiation, running, and swinging workouts. The tidbits in this chapter, although brief, can open doors to trainees that are usually not uncovered through the conventional gym education. 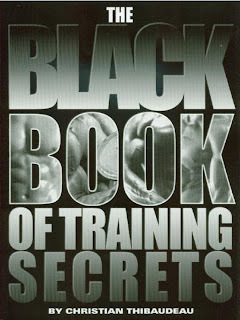 The Black Book of Training Secrets touches on almost every aspect of strength and bodybuilding training that I've had in my 12 years of training. I wish this book had been available 10 years ago. This book doesn't have a specific focus other than training in the global sense. However, a specific focus would have narrowed the usefulness of this didactic journal. Succinctly outlining a vast number of topics without immersing readers in unnecessary theory makes The Black Book accessible to Everyman.